I knew her), who was the mother of Elizabeth Winifred Betteridge of the Betty Shop. in Devon. Mary Ann was born on 4 March 1868 when the family were living at Pyne's Waterworks, Upton Pyne, in 1871.
in 1832 and the death of 440 local people. Following the death of her mother in 1876, Mary Ann’s family came to Kingsdown, where, as a thirteen year-old in 1881, she was recorded as a scholar, lodging with Mary Smith, dressmaker. Her brothers, George, Charles and John, were also living there. Mary Smith (nee Shell) was born at Kingsdown in 1828, the daughter of Isaac and Sarah Shell. By 1891 Mary Ann Betteridge was in service, working as a domestic cook to Henry Pace, a Clerk in Holy Orders, and his wife, Eliza, at 20 Bathwick Hill, Bath. Some time in the late 1890s or early 1900s, she came close to death with diphtheria and was nursed her back to health by my grandmother, Alice Maud Betteridge, then only a schoolgirl. Ever the sensible one and a wonderful cook to boot, I loved my grandmother. The doctor insisted that the sick room should be shut up, but Maud opened the window and Mary Ann returned to life from her deathbed. Afterwards Mary Ann went back to work as cook and this was her employment in 1901 when she was working for a wealthy widow, Ada Georgina Daunt and family at 85 Pembroke Road, Clifton, Bristol. Shortly after this she left Bristol and married Isaac Ford on 12 Jul 1902 when she was aged 34. Isaac lived at Ashley, for most of his life, the son of Jacob Ford, an Agricultural Labourer, and his wife, who confusingly was also called Mary Ann Ford. Isaac worked as a stone mason and he had been married before he met my great aunt. That was sometime after 1881, when he was still living with his parents, but before 1891, when his first wife had died and he was recorded as widower. It is difficult to absolutely identify which Ashley property the Ford family occupied but it is probable that they were always at The Barton because of the consistency of the neighbours, the Newman, Hancock, Tye, Shell and Tyler families, of which more later. 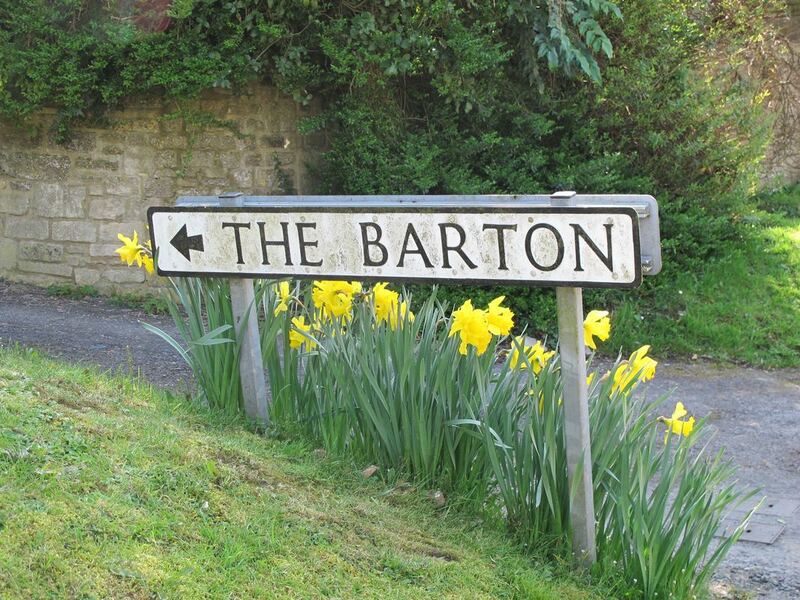 The Barton area appears to have been a close-knit community and there are several marriages between families there. 15 May 1884 Opened hive. Brood in 5 bars. Well-filled, put in 4 bars of foundation, 1 in centre of brood nest. 18 May 1884 Opened hive, put another bar foundation in brood nest, found one put in 15th well-filled with eggs. Put on 1 super (on 9 frames). 20 May 1884 Owing to shrinking of dummy had topside hive about, found bar put in on 18th well-filled with eggs. 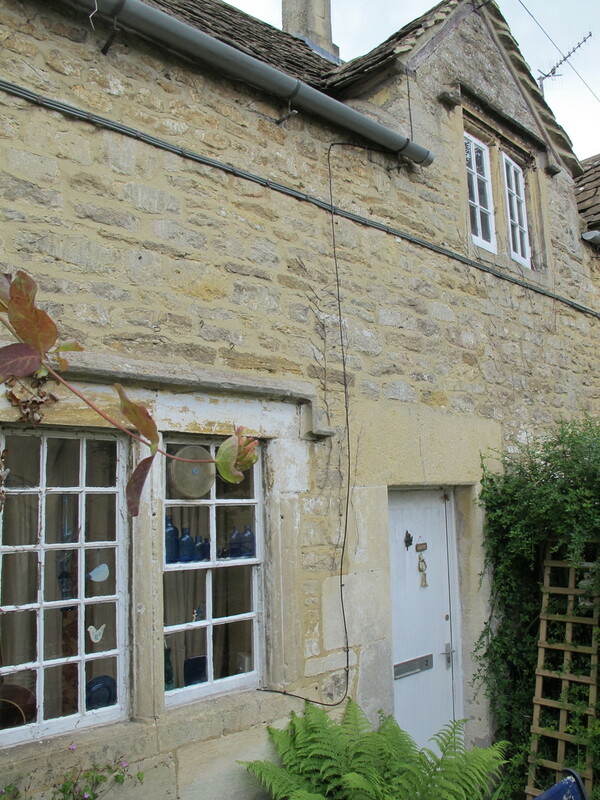 The cottages at The Barton were once held by my ancestors, the Newman family of Box and Bathford. The properties were a curious collection of farm buildings at right-angles to each other, once a range forming a courtyard farmstead. The original buildings could have possibly comprised important sheds, such as cart-shed, granary (corn store), cattle stalls and horse stable. This is a drawing of The Barton cottages which I did myself many moons ago when one of the residents pointed out to me the mason’s mark on the back wall (up the lane to the right hand side of the buildings). I was told that the cottages each had a pigsty and shared an outside toilet. Mary Cogswell, William Chivers, Robert Hancock, and William Ludlow (see map below left). 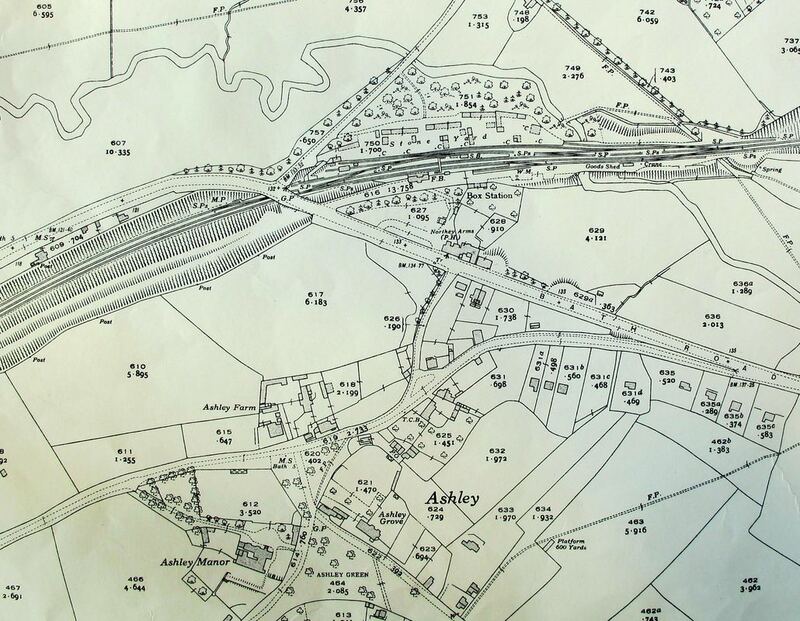 Above Right: the 1900 Ordnance Survey showing Ashley Post Office at 625. Both courtesy Wiltshire History Centre. The Ashley Post Office had existed before Mary Ann Ford's involvement. In the sale of the Northey Estate in 1912 the Ashley village post office was described as: With stone-built and slated double-fronted cottage containing three bedrooms, post office, kitchen and wash-house. At this time it was tenanted by Edwin Gale, a free stone mason from Ditteridge, his wife Ellen and their four children at a rent of £12 per annum. It was recorded as Plot 625 on the 1900 Ordnance Survey map (see map above right). They hadn't lived there long as a decade earlier they were at Vine Cottage, Bath Road, the site of modern-day Vine Court. In the 1911 census, Edwin Gale's Post Office was recorded as having five rooms and next door was Isaac and Mary Ann with two children in three rooms. Isaac died in 1912 and at some point Mary Ann took over the running of the shop next door, probably to provide an income for her family. and in 1933 she was recorded as postmistress at her brother George's fiftieth wedding anniversary. On the outbreak of the Second World War in 1939 Mary Ann and her daughter, Elizabeth, were living at Ashley Post Office described as postmistress and shopkeeper respectively. The area around The Barton had exceptional continuity of occupation. 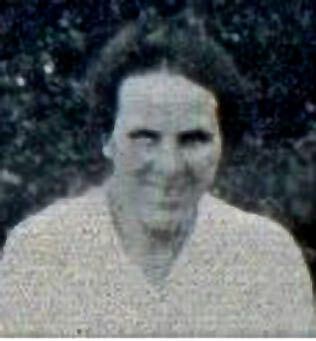 Miss Tye who lived just around the corner at Ashley Leigh recorded her memories that Mary Ann Ford ran the Post Office for over thirty years from 1912 until her death in 1944. Having spent many a happy childhood holiday staying with my great aunts, I have an enormous affinity with them and the area, and have since been back and met the new owners and had tours of their premises, which have much changed now. James Betteridge (born at Box before 1831, died 1887) married Mary Taylor (born Bradninch, Devon about 1832, died 1876). In the 1871 Upton Pyne census James Betteridge was described as Engineman waterworks. Children: Frederick Betteridge (born 1857 in Box) Teacher Episcopal school; Ann Eliza Betteridge (b 1860 at Bradninch, Devon; George Betteridge (b 1863 at Exeter); Charles Henry Betteridge (b 1866 Exeter); Mary Ann Betteridge (born 4 March 1868 at Upton Pyne, Devon buried 29 January 1944 at Box); John Betteridge (born Upton Pyne 1871). Isaac Ford (1856 - 1912) married twice: 1. Unknown between 1881 and 1891; and 2. Mary Ann Betteridge (born 4 March 1868, buried 29 January 1944) on 12 Jul 1902 with witnesses George & Charlotte Betteridge, my great grandparents.